adds another dimension to their sound. The band, whose myspace page says they sound like everyone and everything you’ve ever heard is kind of right, but in a good way. It’s the stuff you like hearing. Throughout the album, I detected flecks of Hendrix, No Doubt and even Joe Jackson, but couldn’t quite put a single description on them. While each of them does their thing well, especially notable are the Mitch Mitchell-esque fills of drummer, Jacqueline Pablo. And don’t be too distracted by bassist Jenna Eyrich’s trademark galoshes to notice she’s pretty damn good on bass. Album highlights: Pity the Fool and Magical Michael open up the CD with a solid, in-your-face rock grooves, just when you think you’ve got their sound pegged, they shift gears to something more thought provoking in The Latter Years, then back to the rock stuff. C’est La Vie shifts again; I hate you Studiofix, this song got to me and I was reduced to tears. But…all is forgiven with the final song Robots (which along with 1,2,3,4, Stop) is so much delicious, head-banging, non-sensical goodness. Not bad for a first release from a band who just stared playing together recently. Yes, they’re all girls, but don’t get caught up labeling them a “girl” band, they are a “rock” band. LG: Names and job duties, please. LG: How did the band get together? , gave it to Jenna and asked her if she could learn how to play it. Jenna: I played piano, so I figured I could. Paco: We needed someone who had access to drums. Jacqueline’s brother had drums so we asked her. Actually, we asked her sister who was in our class first and she declined, so then we asked Jacqueline. LG: Is the band a serious career pursuit or just a hobby? Paco: We’re all college students, but working on the band too. LG: Where, What Year, What are you studying? LG: Who are your musical influences? LG: Where and when was your first gig? SF: Jenna: I’m really glad you asked that question. I would like to follow that up with a piece of advice…if someone you meet over the internet asks you to play at his house, take heed. You could get killed. LG:How long had you been together before that gig? I seriously doubt that. For more info on The Studiofix and shows, go to www.myspace.com/thestudiofix. They have several dates around L.A./O.C. in the next months. There’s also some video up on youtube, but the qualitiy is marginal. 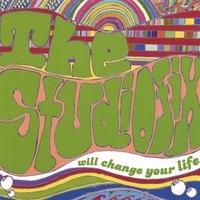 THE STUDIOFIX: Will Change Your LifeNot old enough to buy a drink, but old enough to combine the urgent angst of Eddie Cochran with the funk of James Brown and melodies of The Beatles. Garage without being ’60s. ’60s without being retro. Feminine without being girly. The GoGo’s are in the top 40.